Just because Summer is long gone doesn’t mean you can’t achieve a glowy skin look this season. It’s around this time of year that I start wearing dewy foundations, since I don’t have to worry about the heat melting it away. 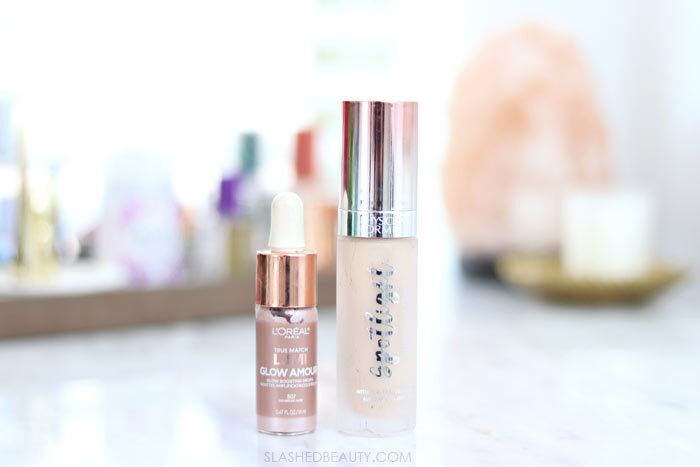 I love the glowy, fresh and youthful look a dewy foundation delivers. However, I know that for some people, dewy foundations aren’t an option— whether it be preference for feel, or skin type compatibility. 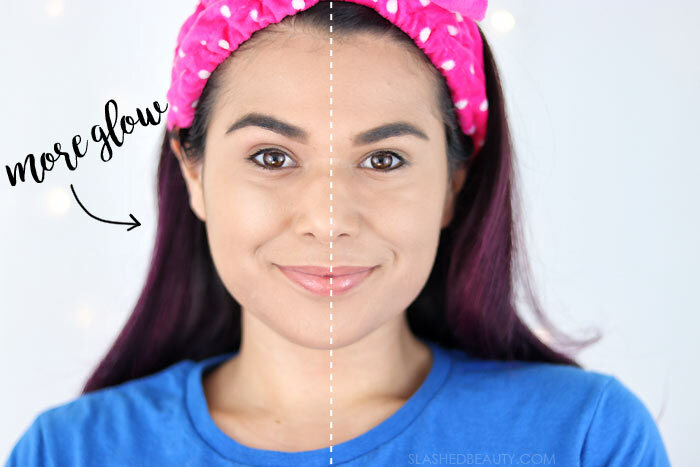 If your go-to foundation has a matte finish, but you still want to show off some glow, don’t lose hope! Aside from layering up the highlight, you can achieve a glowing-from-within look by adding a couple new products to your routine. To add more glow and dimension to my matte foundations, I use an illuminating primer and highlighting drops. Together, these create a beautiful effect without compromising the finish, wear time or coverage of my foundation. 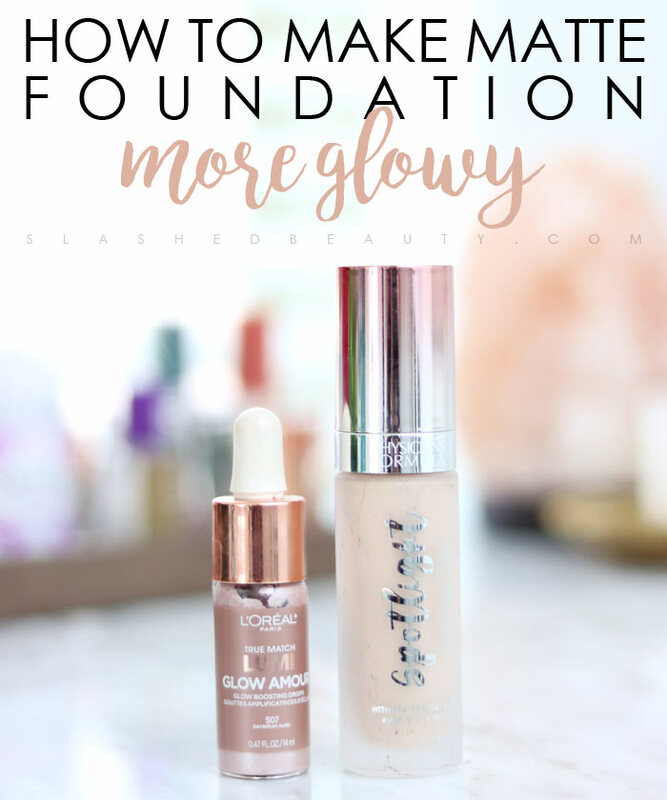 Keep reading to learn how to make matte foundation look more glowy with just these two products! The Physicians Formula Spotlight Illuminating Primer ($12.99) is my favorite to use for this purpose. It’s all glow— not shimmer or glitter particles like in other highlighting primers. Not only does it deliver a beautiful radiance, but the formula contains antioxidants that protect the skin and reduce redness. I also like that it blurs the skin and the highlighting effect does not accentuate any texture or problem areas. 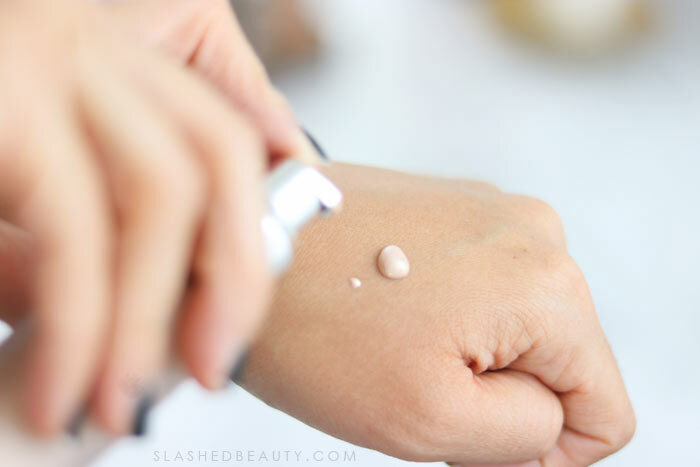 After priming, I add highlighting drops into my foundation before applying to my face. 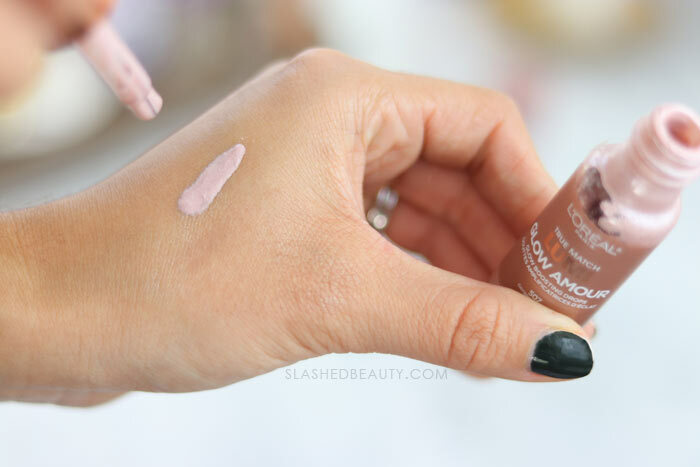 Lately, I’ve been loving the L’Oreal Lumi Glow Amour Glow Boosting Drops ($14.99). I used to only use this product as a liquid highlight for my cheeks, but the game changed when I mixed several drops in with my foundation! It adds just the right amount of glow for a slightly dewy look without overdoing it. It’s super lightweight and I don’t notice it changing the consistency of my foundation at all. I use the shade Daybreak, but there is also a warmer version called Golden Hour. Together, this combination gives me a healthy radiance without appearing wet or greasy like some dewy products can look. Above, you can see the difference between the left side where I’ve used the primer and highlighting drops, versus the right side where I’m only wearing my foundation. For reference, I’m wearing the Maybelline Superstar Full Coverage Foundation. The right side, while even and smooth, looks more flat when compared to my glowy left side that is catching the light more on the cheeks and forehead. I didn’t add any other face makeup or highlight in this photo. The best part about this routine is that you can maintain the benefits of a matte finish without looking dull. You’ll still get the same wear time and oil prevention while having a natural looking glow. What foundation finish do you prefer in winter? U don’t know how much this has been in my mind lately. Because the Mattes r not as flattering on my skin lately and thinking maybe I should try something like this. But wasn’t sure how or what. Thanks so much.